1. DAVID BENNETT (National—Hamilton East) to the Minister of Finance: What recent announcements has the Government made to accelerate the supply of new housing where it is needed the most? Hon BILL ENGLISH (Minister of Finance): On Sunday the Prime Minister announced a new $1 billion Housing Infrastructure Fund to help bring forward the new roads and water infrastructure needed for new housing where financing is a constraint. It is the next step in the Government’s comprehensive housing plan. The contestable fund will be open to applications in high-growth areas. It will be available only for substantial new infrastructure that supports new housing, not to replace existing infrastructure. To access the fund, local councils must outline how many new houses will be built, where they will be built, and when they will be available. David Bennett: What current constraints to infrastructure provision will the fund help to overcome? Hon BILL ENGLISH: As part of its comprehensive plan, the Government recently proposed a national policy statement on urban development capacity that will require councils to ensure land supply for housing and business keeps ahead of growth. Feedback on the national policy statement has been positive. The councils have told us that the infrastructure and its financing is one of the key constraints where more supply is required. Some councils have strict debt limits, which means they lack headroom to invest in infrastructure. The fund will provide more infrastructure, sooner, by aligning the cost to councils with the timing of revenue from development contributions and rates of newly built houses. Denis O’Rourke: Does the Minister agree with home builder Mike Greer on the new $1 billion housing infrastructure loan fund: “It will all be used in Auckland. There won’t be a dollar leaves Auckland, for sure.”; if not, will he give an assurance that other centres will get some? Mr SPEAKER: Either of those two supplementary questions. Hon BILL ENGLISH: The high-growth areas covered by the fund are Christchurch, Queenstown, Tauranga, Hamilton, and Auckland, but, of course, we would expect more houses will be built in Auckland where the highest demand is occurring. David Seymour: What proportion or percentage of funds awarded to councils through this fund will need to be repaid in the long run? Hon BILL ENGLISH: In the long run the councils will repay whatever assistance the Government offers. David Bennett: What options is the Government considering for how the fund could be implemented? Hon BILL ENGLISH: The intent of the policy is to provide upfront cash flow to councils in a way that does not accrue as debt on their balance sheets. One option for achieving this is the Crown Fibre Holdings model, where the Government finances and owns the infrastructure upfront. There would then be an arrangement where the infrastructure is purchased from the Government as houses are built, in the same way that Crown Fibre Holdings repays the Government when new subscribers sign up to ultra-fast broadband. Another option is to use the financial assistance rate for councils in the National Land Transport Fund—a tool that has been used before. These options mean the Government would face some uptake risk if houses are not built, which is why the proposals from the councils need to be very clear about when and where new houses will be built. Denis O’Rourke: Does the Minister agree with Mike Greer on what the Government funding is really needed for when he says: “Government has to pay for the land and provide the housing, otherwise it’s too hard to do it.”; if not, why not? Mr SPEAKER: Again, there are two supplementary questions there. The Minister, the Hon Bill English, can address one of them. Hon BILL ENGLISH: There are many developers who would like the Government to pay for the land so they do not have to take any of that kind of development risk, but we are not going to do that. We are going to help councils with the timing of the revenue they need for core trunk infrastructure that will open up a new supply of new houses. David Bennett: How is the fund expected to impact on the Government’s finances? Hon BILL ENGLISH: Depending on the number and timing of applications, the fund will require the Government to temporarily borrow, up to, but not necessarily actually, $1 billion, increasing net debt until the infrastructure is sold. Because the infrastructure is expected to be sold or financed in the future, when councils can benefit from the greater revenue flows, it is not expected to impact on the Budget capital allowance—any impact on the surplus will depend on the nature of the infrastructure project itself. Denis O’Rourke: What difference will a $1 billion loan fund really make when a new Waterview to Māngere sewer pipe alone will cost $950 million? Hon BILL ENGLISH: It will make the difference that councils say it should make. Councils already have in their long-term plans significant investment in infrastructure. We have discussed in detail what the constraints are for further spending on top of the growth they have already anticipated, which in this case is over 10 percent—in the case of each of these cities—and this is the constraint that the council tells us can be dealt with. David Bennett: What other constraints are there to getting more houses built, aside from infrastructure? Hon BILL ENGLISH: The reason the Government has a comprehensive plan on housing is that there are a considerable number of constraints: for instance, the speed of the planning process, which is run by the councils; the consenting requirements—which consents are issued by the councils; the need to consult local communities, which is a job to be carried out by the councils. And now that the building industry is running so fast, it is becoming apparent that there are constraints in the building industry as to the availability of labour and building materials. Rt Hon Winston Peters: If any of that is true, why on earth has he not told the chairperson of the Finance and Expenditure Committee the facts, rather than having him get up here asking these innocent, stupid questions? Hon Gerry Brownlee: I raise a point of order, Mr Speaker. How can you take that question as being a reasonable question for the House? The member asked “if any of that is true, why hasn’t he conveyed the facts?”. The two do not mix. It is one or the other. Mr SPEAKER: I was going to allow the question to stand to give the Minister a fairly wide chance to answer it, but in this case there is no responsibility by the Minister for a member of Parliament who happens to chair a select committee. 2. ANDREW LITTLE (Leader of the Opposition) to the Prime Minister: Does he stand by his statement regarding housing that “I don’t think it’s a crisis”? Rt Hon JOHN KEY (Prime Minister): Yes, I am concerned about rising house prices. It is certainly one of our biggest challenges, and that is why the Government has a comprehensive plan to deal with it. Andrew Little: Does he think the Auckland housing market is under control? Rt Hon JOHN KEY: Well, that is a sort of subjective comment, but certainly there is a record amount of construction taking place in Auckland. I think the Auckland Council is working constructively with the Government, and the Auckland Council certainly looks to be very supportive of the announcements that the Government made on Sunday. ANDREW LITTLE: Given that only 9,400 new houses have been consented in Auckland this year and that Bill English says that only 5 percent of new builds are affordable, does this mean that fewer than 500 affordable houses will be built in Auckland this year? Andrew Little: How does he reconcile his claim that there are plenty of houses in the pipeline with Statistics New Zealand’s statement that “The trend for the number of new dwellings consented in Auckland has tailed off since late 2015.”; or is that just another inconvenient fact for his Government? Rt Hon JOHN KEY: Consenting for new houses in Auckland is at the highest for a decade. The Government can see, in the great number of special housing areas in Auckland, how many have infrastructure works on them. All of the feedback, both official and otherwise, that we get from Auckland Council is that it is continuing to process those consents at a very fast rate, and I have no doubt that both the national policy statement, potentially the implementation of urban development authorities, and the billion-dollar fund announced on the weekend—all part of the Government’s comprehensive plan—will see more houses built. Andrew Little: Does he agree with the New Zealand Herald that his piecemeal efforts have failed to resolve the housing crisis and that lending money to councils will be no different? Mr SPEAKER: Order! [Interruption] Order! Mr Twyford—Order! A little less interjection. Mr SPEAKER: No. I am getting email from members of the public who are now getting quite fed up with the fact that they cannot hear a question and often they cannot hear an answer because some members to my left either do not like the question or do not like the answer. Mr Macindoe has a right to ask a question. I can deal with it more severely if I need to. I do not want to. I am just seeking some cooperation from members to my left. Mr SPEAKER: Order! This is a point of order. Hon David Parker: The idea that the Government can load up a question by saying that its response is comprehensive, as an assertion, is what caused the disorder. Mr SPEAKER: Order! [Interruption] No, I do not need any assistance—[Interruption] Order! No, I do not need your assistance, but I do thank you for offering it. I will determine whether a question is in order or not. There will be some questions asked that members do not like the tone of, and that applies to both sides. Some Opposition questions members on my right-hand do not like, and the other way round. I will be the sole determinant, but I thank Mr Parker for his assistance. Tim Macindoe: What steps is the Government taking as part of its comprehensive plan to deal with housing and housing affordability issues? Rt Hon JOHN KEY: There are many parts to the Government’s comprehensive housing plan. They include our social housing bill, our emergency housing programme, special housing areas, the expanded HomeStart scheme for first-home buyers, freeing up surplus Crown land, the national policy statement, Resource Management Act reforms, and the extra tax measures we took last year. On Sunday I announced a new $1 billion Housing Infrastructure Fund to support infrastructure needed for new housing in high-growth areas, and we are considering independent urban development authorities for areas of high housing need. By any definition, this is a very comprehensive housing plan. Denis O’Rourke: If it costs $1 billion to fix a housing challenge in Auckland, how much will it cost to fix the housing crisis in all of New Zealand? Rt Hon JOHN KEY: The $1 billion is actually only a small part of the infrastructure that is required to build all of the houses around New Zealand, but the Government is, I think, making an important step to allow those councils to bring forward housing that would otherwise be waiting. But, by any definition, the Government’s response is wide ranging, and we can see that by the fact that we are in the biggest housing boom and construction boom we have seen for a very long time. Andrew Little: In light of the fact that councils can already borrow at 3 percent a year, meaning his new loan facility really just amounts to a $30 million-a-year saving for councils, is that seriously the best and most comprehensive response he can come up with for a shortfall of 40,000 houses? Rt Hon JOHN KEY: The issue is not the interest rates that councils might be able to borrow at; the issue is whether the councils run into their debt ceilings. The advantage of the fund is that it does not go on to the balance sheet of the councils until they are at a point of actually having the cash up front. The fact that the member does not understand the way that the balance sheets of a council are made up would come as no surprise to members on this side of the House, but he really should learn some basic economics. Tim Macindoe: What reports has the Prime Minister seen in support of the Government’s new $1 billion Housing Infrastructure Fund, which he announced at the weekend? Hon Annette King: What did the New Zealand Herald say? Mr SPEAKER: Order! That is a good example of the way an interjection from my left to my right causes some disorder. If the Prime Minister would now address the question. Hon Member: He’s a bit sensitive. Rt Hon JOHN KEY: Yeah, that is true. That is why Grant was promoting the article. The Property Institute of New Zealand said these measures are great. Local Government New Zealand said that the new fund is an example of local and central government working together. The Queenstown Lakes mayor said that it would certainly be right that looking for these projects would be an excellent idea. And the Auckland mayor said that it is a significantly sized fund. There has been widespread support for the new Housing Infrastructure Fund. Andrew Little: How many more housing announcements that were not in the Budget is he planning to make to tackle a crisis he says does not exist, or is the Budget not comprehensive any more? Mr SPEAKER: Order! [Interruption] Order! I have told this side off a number of times for its interjections. They are just about as insistent from one member to my right, and they will cease. Andrew Little: Is it not time for him to admit what every New Zealander can see: that his Government has no comprehensive plan and that what we need is a Government-led programme to restore the Kiwi dream of homeownership by building thousands of affordable homes for Kiwis to buy? Rt Hon JOHN KEY: If the member was to be believed, then we would not have the highest level of building activity in Auckland for a decade. If the member was to be believed, we would not have 24,000 extra people working in the construction sector in Auckland alone. If the member was to be believed, the special housing areas that have been released in Auckland by the Government would not be being built. If the member was to be believed, the Auckland Council would be rejecting the $1 billion infrastructure fund that the Government announced in the weekend; in fact, it is quite the opposite. If the member was to be believed, then the tax changes that we announced last year would not have had any impact on the market. If the member was to be believed, then the Crown land that we released would not be about to be built on. The facts of life are that the housing market is a lagging indicator, but it is certainly ramping up supply. 3. JAMES SHAW (Co-Leader—Green) to the Prime Minister: Ka tū a ia i runga i tāna i whakapūrongotia, “suggesting the Government needed to build more houses was a ‘misplaced’ idea”? James Shaw: Why does he keep saying the Government should not build houses, when previous Governments have successfully built thousands of affordable houses for New Zealand families, like the one he grew up in? Rt Hon JOHN KEY: Because the private sector is well and truly equipped to build the houses. What it ultimately needs, though, is planning laws that support that, council plans that support that, and infrastructure that can support those builds. All of those things are happening under this Government. I really seriously think if the member is telling us the answer to resolving the challenges in Auckland’s housing—or indeed housing issues around the country—is to get people employed by the Government as chippies building those houses, I think we would be better to leave it to the private sector. James Shaw: What has changed between last month, when his Minister for Building and Housing told a Local Government New Zealand delegation that it would be wrong for central government to help out with infrastructure costs, and this month, when he announced a billion dollar fund to help out with infrastructure costs? Rt Hon JOHN KEY: As is always the case with quotes, and as I demonstrated with the one from the member before, they are often taken out of context. But the Government, and in fact the Minister, has been talking to Local Government New Zealand for over a year. These issues of infrastructure have been raised for quite some time, not only by mayors and councils but by others. I would have thought the member would be applauding the fact that the Government is making it easier for the councils to connect up the main infrastructure, to allow affordable and other homes to be built. James Shaw: Will the Government prevent landbanking and make sure houses actually get built in areas developed with the infrastructure fund, or will it look the other way while speculators make a quick buck, like they did in the special housing areas? Rt Hon JOHN KEY: I think it is important to understand that the infrastructure fund is used for infrastructure that connects these subdivisions—ultimately it is the core infrastructure. Developers still have responsibility for the infrastructure on the land that they develop. Interestingly enough, if the member wants to ask the Minister for Building and Housing I am sure he can give you the exact information. But I think of the 200-odd special housing areas, over 130 of them now have works on them. Landbanking is always an issue if there are, potentially, blockages in the system, but ultimately people hold on to land for longer than they otherwise probably should do only if it is such a long way out that they are taking an incredibly long-term view or, more likely than not, that the price rise in land is faster than the cost of capital. By releasing a lot of land on to the market, as we did in Christchurch, you can demonstrate quite clearly that it actually resolved that issue. James Shaw: Are the Government’s musings about using a Public Works Act to take private land for housing a confession that he has let this crisis get totally out of control? Rt Hon JOHN KEY: No. The Minister for Building and Housing was simply making the point that under an urban development authority (UDA), the powers of a UDA could be quite broad. It is always possible that within an area defined as part of an urban development authority there could be one particular piece of land—or block of land—that might need to be acquired to allow the overall block to be developed; or there may need to be changes in designations like reserves, which could then be replaced somewhere else. That is not really the preference of the Government—to be riding roughshod over property rights—our preference is always to negotiate with parties. But, ultimately, the member himself is admitting that this is a significant challenge and we do need to release more land, faster. James Shaw: When he said, over the weekend, that there is no room for Government complacency, is there a different word to describe a Government that has stood by while the average Auckland house price shot towards $1 million and the number of people who are homeless increased to record levels? Rt Hon JOHN KEY: I do not think it would be a fair criticism to say that the Government has stood back. We have a record level of activity taking place. We have significant parts of the plan—that, actually, the member’s own party has resisted. I think it is worth remembering that if you go back and have a look at the first 3 or 4 years when I was Prime Minister, the issue of housing was not a significant issue. What has turned round in that time is that New Zealand has become a much more attractive destination, interest rates are lower, optimism in the economy is very strong, and the Government’s policies are working—which is actually driving much greater demand in the New Zealand economy. So we have responded to that—that is why there are so many more houses being built in Auckland. Do we need to build some more? Yes, but we are working on that. James Shaw: Amongst all of the announcements that this Government is making about housing, why is it that the one thing it consistently refuses to do is to actually build more houses? Rt Hon JOHN KEY: Well, I thank the member for confirming that the Government has a comprehensive plan for housing, because it does. The very point about building a house is not who employs the builder. It does not matter whether the builder is employed by a ministry in the Government or Fletcher Challenge; they will still face the same issues about the length of time that it takes to put in infrastructure, the length of time that it takes at council to issue the plans, the amount of land that is ultimately available, and the infrastructure that is required to support that. The member seems to miraculously think that, just because the cheque for the wages of a carpenter would come from a Government department and not a private sector company, somehow it would make things go faster—it will not. If the member wants to go faster, then come and support the Government in its Resource Management Act reforms. 4. SARAH DOWIE (National—Invercargill) to the Minister for Tertiary Education, Skills and Employment: How is the Government ensuring New Zealanders have the skills to strengthen our connections across the Asia-Pacific region? Hon STEVEN JOYCE (Minister for Tertiary Education, Skills and Employment): Last month I announced $34.5 million in funding in Budget 2016 for a new programme to develop new Centres of Asia-Pacific Excellence (CAPEs) in New Zealand universities as part of the Innovative New Zealand package. These centres will be cross-institutional centres of excellence in the language, culture, politics, and economics of countries or groups of countries within the Asia-Pacific region. New Zealand’s prosperity is increasingly tied in with our region and we must secure our future by investing more in preparing young people to understand the languages, culture, and economics of this diverse range of countries. Sarah Dowie: How will CAPEs operate? Hon STEVEN JOYCE: The funding will be available to support up to three Centres of Asia-Pacific Excellence, which will be modelled on the successful Centres of Research Excellence programme. We intend to set up the initial CAPEs in universities around the country, specialising in countries or groups of countries in North-east Asia, South-east Asia, and Latin America. Each CAPE will develop strong linkages with its region of speciality, run student and faculty exchanges, and become a focal point for New Zealand’s relationship with that part of the world. I anticipate that CAPEs will train language-capable graduates for New Zealand exporters, the Ministry of Foreign Affairs and Trade, and other Government agencies. Sarah Dowie: Why do we need to strengthen our connections across the Asia-Pacific region? Rt Hon Winston Peters: That’s enough. Mr SPEAKER: Order! I have already told that Minister on more than one occasion that I will not allow the interchange, particularly then referring to members by their Christian name. That is an informality that is just a step too far for this House. 5. PHIL TWYFORD (Labour—Te Atatū) to the Minister responsible for HNZC: How many houses, if any, will Housing New Zealand complete building in the next 2 years? Hon BILL ENGLISH (Minister responsible for HNZC): Housing New Zealand advises it will have built 801 houses this financial year just ended and 1,279 houses in 2017-18. This includes redevelopment of existing Housing New Zealand properties. Grant Robertson: Oh, so they’re not new ones. Hon BILL ENGLISH: Well, redevelopment is new houses; that is a total of 2,080 dwellings over 2 years. In addition, Housing New Zealand advises it will buy and lease or re-sign a further 720 dwellings over that 2-year period. The member should also understand that other agencies will be producing houses for the market and for social housing: Tāmaki Redevelopment Company, Hobsonville Land Co., the Auckland Crown land programme, and “CHiPs”—that is community housing providers—which are contracted to the Ministry of Social Development. So the houses that Housing New Zealand builds are some, but not all, of the new housing supply for social housing. Phil Twyford: How many families are living in the under-construction houses that he has been counting as meeting his goal of “building 2,000 new homes by December 2015 and 1,500 per year thereafter.”, given that the actual number completed is around half that? Hon BILL ENGLISH: The figures the member is pointing to show the benefit of the special housing areas, which are now allowing Housing New Zealand to build up the pipeline. Housing New Zealand has to deal with the same constraints as everyone else, with the additional complexity that it must negotiate with each tenant to relocate them before it can do any redevelopment of its brownfield sites. It is pretty clear that it did not meet the target set at the beginning of 2013. It has now geared up considerably to build, as we said, 2,000 houses over the next year or two, and other Government agencies will also be contributing to what is going to become a large volume of new housing off Crown land. Phil Twyford: How does he expect the public to have any confidence at all in his building targets when he keeps counting bare land with earthworks under way as a built house? Phil Twyford: Who does he blame the most for the Government’s failure to meet its own modest target for building State houses: the council; Housing New Zealand; State house tenants; local campaigns; or his own lack of political will, given that he said 2 years ago that if we want less stock, there is not much point in building State houses? Hon BILL ENGLISH: The member, I think, does have an understanding of the constraints, particularly on larger-scale redevelopment. All of those factors that the member has mentioned mean that it takes a number of years to build up the pipeline, and the member can be reassured that the pipeline is building up, contributed to by Housing New Zealand, the Crown land programme, Hobsonville Land Co., and Tāmaki redevelopment. The member is welcome to go and look at each of those to see just how the progress is coming along on completed houses. Phil Twyford: Does he find it any wonder that there are so many families and children living in cars and on the streets, when the amount of State housing declines every year under his watch? Hon BILL ENGLISH: The member is incorrect about that. The number of State houses and social houses in Auckland is growing quite rapidly. I look forward to the member supporting the Government’s effort to make sure that the Auckland Unitary Plan, which is going to be delivered in a month or so, will enable sufficient supply of houses. Twenty years of misdirected planning in Auckland has had the biggest impact on low- and middle-income households, who find themselves excluded from a market where the council spent 20 years trying to stop the city growing. We are working with them to change that. 6. SIMON O’CONNOR (National—Tāmaki) to the Minister for Building and Housing: What response has he received from local government leaders and the housing sector to the Prime Minister’s announcement of a billion dollar Housing Infrastructure Fund to assist councils in high-growth areas bring forward new development? Hon Dr NICK SMITH (Minister for Building and Housing): The new fund has been widely welcomed as the next logical step in the Government’s wide-ranging housing plan by Local Government New Zealand, by mayors, by the Property Institute of New Zealand, by the Employers and Manufacturers Association, and by major players in the building industry. It builds on our work to fast track planning and consenting requirements, in that in some areas councils are struggling to provide the required pipes, roads, and other infrastructure to keep up with the record pace of house building. The four councils that have publicly stated that they will be seeking support from the new fund are Auckland, Hamilton, Tauranga, and Queenstown. Other areas may become eligible depending on the growth projections for the next 10 years, to be updated by Statistics New Zealand later this year. Simon O’Connor: How will the new housing infrastructure fund fit alongside other parts of the Government’s comprehensive housing plan, particularly the national policy statement on urban development? Hon Dr NICK SMITH: The Housing Infrastructure Fund fits very neatly alongside the new requirements for councils to free up more land. The best way to avoid land banking is to create genuine competition in section supply. This is why that national policy statement requires a 20 percent oversupply. This, however, puts pressure on councils to provide sufficient infrastructure, particularly for those fast-growing councils that are approaching debt limits. This is a practical response that is part of our ongoing plan to increase housing supply. Simon O’Connor: How does the current pace of building construction compare historically; and what steps is the Government taking to grow the capacity of the sector to build the additional $1 billion of infrastructure? Hon Dr NICK SMITH: Building activity is at an all-time high of $18 billion per year. This is 50 percent higher than at the last peak, back in the mid-2000s, and 28 percent higher in real terms. In Auckland, residential building activity has trebled from $1.4 billion to $4.3 billion per year, and over the last year, it has grown by another 26 percent. The sector is meeting capacity limits and growth pressures. The Government announced further funding in the Budget of $14 million for apprenticeship training. We now have a record 42,000 people training in the apprenticeship sector. Phil Twyford: Does the Minister agree with the New Zealand Herald that the Government’s infrastructure announcement is just tinkering on the supply side of the housing market to feed an insatiable demand by speculators, and that the Labour Party’s policy would have been a much better option? Hon Dr NICK SMITH: It is interesting to note that the pace of new building that we are achieving is about double what Labour said in 2008 was achievable in this term of Parliament. I sometimes disagree with the New Zealand Herald, like when it assumed that those people with Chinese-sounding names were the problem in the housing sector. Rt Hon JOHN KEY: —elective surgical operations taken. Rt Hon Winston Peters: When Prime Minister Turnbull was comfortably ahead in the Australian election campaign, why did he go public in supporting Mr Turnbull and cause his support to nosedive? Rt Hon JOHN KEY: I think the furthest apart we ever saw it was 51:49, but I am thrilled that the member thinks that I can impact so many voters in Australia. Rt Hon Winston Peters: Why, with his record of endorsements in the Northland by-election, the flag referendum, the Trans-Pacific Partnership agreement, Brexit, the Panama Papers, the housing crisis, and now the Australian election, will he not stop being a scatological Midas? Rt Hon JOHN KEY: I will—I will. But I just need to inform him that the last thing I said before I came into the House was: “Winston Peters is going to do well in 2017.” Ha, ha! Rt Hon Winston Peters: To put my sense of panic at rest now, is it not a fact that Hillary Clinton and Donald Trump have called him, pleading that he not back their campaigns? Rt Hon JOHN KEY: No, neither of them has rung, but if they do, I will be more than happy to have a chat with them about international events, and when I am away next week, you never know whom you might run into. 8. Su’a WILLIAM SIO (Labour—Māngere) to the Minister for Pacific Peoples: Does he stand by his statement in Estimates Hearings for Vote Pacific Peoples that Pacific home ownership levels have increased? Hon Peseta SAM LOTU-IIGA (Minister for Pacific Peoples): E Te Mana Whakawā, tēnā koe. I do stand behind my statement in the Estimates hearing that the Statistics New Zealand report published in June shows that nearly 2,000 more Pacific people own their home in 2013 than in 2006. Compare that with the last time Labour was in power, between 2001 and 2006: the number of Pacific people owning homes over that time decreased by 7,000 people. Su’a William Sio: Is the household net worth statistics report incorrect that Pacific peoples’ average net worth is $12,000, a ninth of the European population’s $114,000, and that that is largely because Pacific homeownership rates have fallen? Hon Peseta SAM LOTU-IIGA: No, that is not correct; it is not because of that at all. What we do know is that Pacific homeownership rates will go up with higher education, and we can point to the statistics around early childhood education, which is now at 91 percent whereas it was 84 percent under Labour. We can now point to the number of Pasifika students gaining tertiary qualifications, which rose by 75 percent between 2008 and 2014. Su’a William Sio: So is Statistics New Zealand wrong when it says Pacific people have had the greatest homeownership rate falls, having fallen 34.8 percent to just 18.5 percent? Hon Peseta SAM LOTU-IIGA: I say again that the rates that I referred to in that Estimates hearing were on absolute numbers, and they have gone up under National. 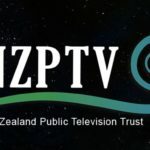 Su’a William Sio: Is his Project Tatupu investigation aiming to increase Pacific homeownership, or is it just a way to make Pacific people homeless and unemployed in the regions instead of homeless and unemployed in Auckland? Hon Peseta SAM LOTU-IIGA: No, it is not. It is about taking opportunities in the regions where there are jobs, and where there will be opportunities for Pacific people. We are making an investigation because we believe that Pacific people deserve the right to work and to gain meaningful employment. Su’a William Sio: Why does he continue to deny the fall of Pacific homeownership when under his Government we now have a growing number of Pacific families in homeless situations, living in cars, garages, boarding homes, and living in emergency and overcrowded housing that they do not own? Hon Peseta SAM LOTU-IIGA: Again I refer to that member’s party’s record in Government in 2001 to 2006, and it was pretty poor. Mr SPEAKER: Order! [Interruption] Order! I just need some cooperation from the Minister. The question was, effectively: “Why does the Minister continue to deny … ?”. I am going to invite Su’a William Sio to repeat the question, but you need to address that question rather than just flicking straight back to a previous administration. 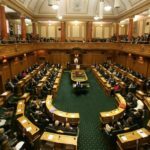 Su’a William Sio: Why does he continue to deny the fall of Pacific homeownership when under his Government we now have a growing number of Pacific families in homeless situations, living in cars, garages, boarding homes, and in overcrowded and emergency housing that they do not own? Hon Peseta SAM LOTU-IIGA: We know that homeownership rates have come down across the board, but what I will say is that the Government is focused on building more social housing and more emergency housing. We have implemented special housing areas and expanded the HomeStart scheme for first-home buyers, and those are things that benefit Pacific people. 9. JONATHAN YOUNG (National—New Plymouth) to the Minister of Transport: What recent improvements has the Government made to State Highway 3 in New Plymouth? Hon SIMON BRIDGES (Minister of Transport): Alongside the hard-working MP for New Plymouth it was my pleasure to recently open New Plymouth’s $24 million Vickers to City road upgrade project. This stretch of road to the north of the city was starting to see a growing number of problems and was near capacity, causing delays and frustrations for motorists and freight transporters alike. The Government has now upgraded the road to include two lanes in each direction and has put in place safer and more efficient intersections as well as better facilities for walking and cycling for the people of New Plymouth as well as the wider region. JONATHAN YOUNG: In what ways will the improved Vickers to City road benefit the people and the businesses of New Plymouth? Hon SIMON BRIDGES: Now that the improvements have been made, local traffic is moving much more freely to the north of New Plymouth. Freight is also moving more easily though the area, benefiting both the port and industries to the north of the city. Businesses are also benefiting as it is now much easier to move goods and services around the city and region. So it is clear that the improvements to the Vickers to City road have been an important development for New Plymouth that will support the future economic growth of that great city. 10. EUGENIE SAGE (Green) to the Minister for Climate Change Issues: Ka whakaae a ia ki tā Te Kaikōmihana Pāremata mō Te Taiao, e kī nei, “climate change is by far the most serious environmental issue we face”? Hon PAULA BENNETT (Minister for Climate Change Issues): I do agree in many respects that I think climate change is a very serious issue, and one that New Zealand and the world face. Eugenie Sage: If the Minister says that climate change is a serious issue, how can she say that when the Ministry for the Environment has only 1.4 full-time staff who are responding to the effects of climate change and providing advice on that? Hon PAULA BENNETT: Certainly within the Ministry for the Environment there are more people than that who are giving me advice as the Minister for Climate Change Issues, but the work that is going on across agencies is also important. Whether it is through the transport portfolio, and those working on public transport initiatives and electric vehicles; or there is work going on within science and research that is extensive as well, on the urban cycleways, to name some; and through AgResearch, and others. There are a number of officials who are working on climate change – related issues across Government. Eugenie Sage: How can she say she is taking transport issues seriously in relation to climate change when her Government has done no substantive analysis in the past 2 years on the risks of sea-level rise to 2,000 kilometres of low-lying roads in New Zealand? Hon PAULA BENNETT: I can say it quite simply because actually we are investing a record amount in public transport because of the investment that we are putting into cycleways and other ways of transport around this great country of ours. Although the analysis to the detail the member might want may not have been done, certainly the forward planning and the future planning within transport has been looked at. Mr SPEAKER: Leave is sought to table that particular document. Is there any objection? There is none; it can be tabled. 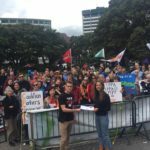 Eugenie Sage: How can the Minister say she is taking climate change seriously when her Government has more than halved the funding for the very people in her ministry who are tasked with finding solutions to New Zealand’s rising climate pollution? Hon PAULA BENNETT: Quite simply because we have an ambitious programme of work that is going on around climate change issues. Whether it is the changes we recently announced to the emissions trading scheme (ETS), where submitters will have to pay the full costs of their emissions by 2019; the second phase that is going on in the ETS review; the work that is going on within forestry, with AgResearch, and with sustainable farming, which is actually better than anywhere else in the world; the work that is now going on as far as ratification of the Paris Agreement, which will then mean that we have that momentum globally; or the assistance that we give internationally on emissions trading schemes and also on forestry and agriculture—I think this country takes it seriously and I think we have got a very ambitious work programme. Eugenie Sage: I seek leave to table an analysis prepared by the Parliamentary Library on 21 June that shows that between 2011 and 2016 the Government slashed funding for Ministry for the Environment officials working on domestic climate change policy. Mr SPEAKER: No. That information is freely available to all members if they want to go and analyse Budget documents. 11. JOANNE HAYES (National) to the Minister for the Community and Voluntary Sector: What recent announcements has she made in terms of support for community-led development projects? Hon JO GOODHEW (Minister for the Community and Voluntary Sector): E te Mana Whakawā, tēnā koe. The recent launch of the Community-led Development Programme marks a step change for the long-term support of community projects, and will have a significant positive impact for successful applicants and their communities. The programme will allow communities to identify community aspirations, then partner with both central and local government, private funders, businesses, and local iwi to achieve their goals. Once fully implemented in 2019-20, the total value of investments per year will be up to $3.56 million. Joanne Hayes: How is the new programme different from previous investment schemes? Hon JO GOODHEW: The 5-year community-led development pilot programme wrapped up on 30 June this year. The new programme takes the best elements of the former community development scheme and community-led development and modernises them, including paid community development workers, a partnership approach with relevant agencies, intensive advisory support from Internal Affairs, and flexible funding. The Community-led Development Programme is about local people finding local solutions to their problems. It will be open to communities, hapū, and iwi. A contestable expression-of-interest process will open in September this year. 12. MEKA WHAITIRI (Labour—Ikaroa-Rāwhiti) to the Minister for Māori Development: Does he stand by his statement about Te Puea Marae’s manaakitanga and work with the homeless that “there’s a hell of a lot of work that the State should be doing over and above just waiting for a crisis to happen and then go to it”; if so, what more does he think the Government should have done in advance? 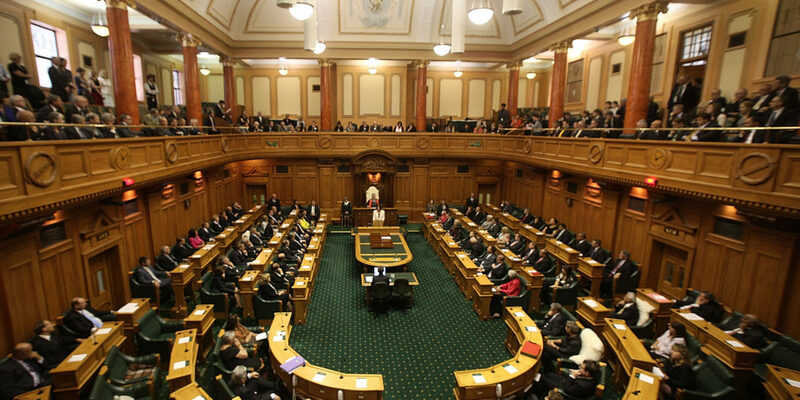 Meka Whaitiri: I raise a point of order, Mr Speaker. That question was around a statement the Minister made, and what more he thought he could have done in advance. I do not believe the Minister answered the question. Mr SPEAKER: My difficulty is that at the time the Minister spoke, and spoke in Te Reo, my interpretation was not coming through loudly enough so I did not hear the answer. Can I ask the Minister to address the question again? I will listen and then rule whether the question has been addressed. Meka Whaitiri: Did he, as Minister for Māori Development, make that statement before or after he voted for the sale of State houses? Iain Lees-Galloway: I raise a point of order, Mr Speaker. I listened very carefully to the question and to the answer, and that answer in no way addressed the question that the member asked. She asked whether he made the statement before or after he voted in a particular way, and the answer did not address that question. It was a straight question. Mr SPEAKER: I am not sure when that particular vote was. That is my difficulty in ruling whether it can be answered. Meka Whaitiri: Does he, as Minister for Māori Development, think it is a good idea to sell State houses while whānau live in cars and garages? Meka Whaitiri: Does he, as Minister for Māori Development, agree with Nick Smith that plummeting Māori homeownership is because Māori are not educated enough? Meka Whaitiri: Does he, as Minister for Māori Development, feel proud about propping up a Government that blames whānau for homelessness, blames whānau for living in cars, and blames whānau for low homeownership rates? Does that make him proud? Mr SPEAKER: Order! [Interruption] Order! The member—[Interruption] Order! Iain Lees-Galloway, resume your seat. When I consider the tone of the question, I do not consider that there is anything out of order in the way the Minister started the question. CHRIS HIPKINS (Senior Whip—Labour): It is actually just a point of order of logistics. This being Māori Language Week I am sure members who are able to will be using Te Reo Māori. I notice that around the House a number of headsets that assist those of us who are not fluent Te Reo Māori speakers are missing, and therefore we have not been able to follow the debate. I wonder whether that can be addressed before the next time we have question time so that we can all follow along if we are not fluent Te Reo Māori speakers. Mr SPEAKER: I will guarantee to the member that I will have that addressed before question time tomorrow. I apologise that it has been inadequate because of that.